With our OHTS: the carrier only moves backward and forward. It may not look like much, but this simple mechanism connecting the target hanger to the carrier eliminates the biggest cause of down time on ranges. By allowing the hanger to swing back freely in reaction to errant shots, the carriers can take direct hits day after day without breaking. 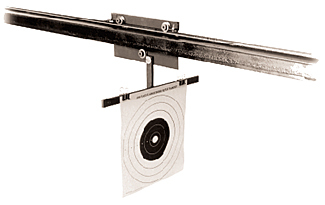 Mounted inside the shooting stalls, selector switches attached to a simple electric motor place the target stops precisely where you want them down range.